All transactions are safe and secure with a reliable history in online purchasing behind each of our associates. 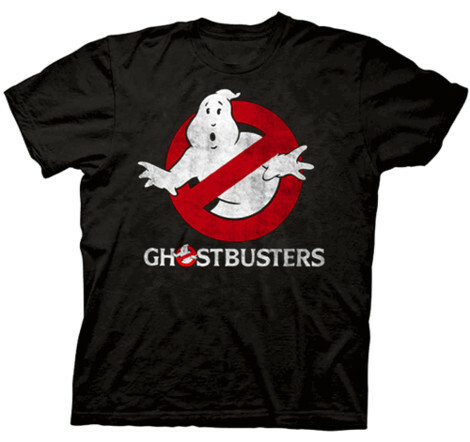 Buy the Ghostbusters Distressed Logo t-shirt to own Ghostbusters clothing and merchandise. A popular quote from the Ghostbusters movie, "I've been slimed!" became equally as popular as the "Who ya gonna call?" tagline featured in Ray Parker Jr.'s song "Ghostbusters" from the movie's bestselling soundtrack. The lyrics to the song present a handful of paranormal predicaments that lead the singer to ask his audience, "Who ya gonna call?" A chorus of voices reply, "Ghostbusters!" Repeat the I've Been Slimed quote in the Ghostbusters logo t-shirt shown on the left. In addition to the Ghostbusters Distressed Logo tee above, browse the Ghostbusters Clothing Gallery for more apparel like men's and women's clothes, kids shirts or hoodies.